The Pittsburgh Modular Synthesizers Lifeforms SV-1 Blackbox is a complete, standalone desktop format modular synthesizer. A full compliment of analog tools for sonic experimentation stuffed into a portable steel enclosure. Two patchable oscillators and our legendary state-variable filter are paired with a perfectly curated set of synthesis components including a dual sub oscillator, dual, chained mixers, a plucky, four stage envelope generator, sample and hold, noise, low frequency oscillator, voltage controlled amplifier, a feature rich MIDI to CV converter, and a pair of utility signal splitters. A standalone modular powerhouse, the Lifeforms SV-1 Blackbox provides absolutely everything you need to create gigantic and iconic synth sounds: roaring bass, shimmering leads, lush pads and warm drones are only a few knob turns away. Instantly, out of the box, a rich feature set with a fluid, easy to understand interface empowers you to create vibrant, thick tones. A few patch cables Modulation and Tools sections fill out the analog SV-1 modulation capabilities with a triangle and square LFO, two sub-octave oscillators chained to the main oscillator, and noise with sample & hold. The suggested retail price for the Lifeforms SV-1 Blackbox modular synthesizer is $699 and it begins shipping to authorized resellers August 12. More information is available at pittsburghmodular.com/blackbox-sv1. Our best sounding synthesizer yet, Lifeforms systems are available in three configurations. System 101, System 201, and System 301 are the perfect gateway to the eurorack modular synthesizer world. Interactive inspiration machines. The next generation of our System line of eurorack synthesizers harnesses the power of the new Lifeforms modules and Structure enclosures. Designed around the Lifeforms SV-1 modular analog synthesizer voice and anchored by the classic Pittsburgh Modular filter and two full range analog oscillators packed with harmonically rich waveforms, the Lifeforms Systems offer a rich sound palette with the flexibility of an open, fully patchable analog voice architecture. The System 201 and System 301 also include the Lifeforms KB-1 pressure sensitive keyboard controller. The pressure sensitive keyboard maximizes the creative process with arpeggios, sequences, triggers, voltage memory, and more. More information on the entire Lifeforms line is available at pittsburghmodular.com/lifeforms-synthesizers. The Lifeforms SV-1 is a fully patchable synthesizer module, destined to be the heart and soul of any eurorack modular system. It features two independent, full-range analog oscillators, and the unmistakeable sound of the Pittsburgh Modular filter paired with a highly curated set of modular tools designed to fuel the creative fire. 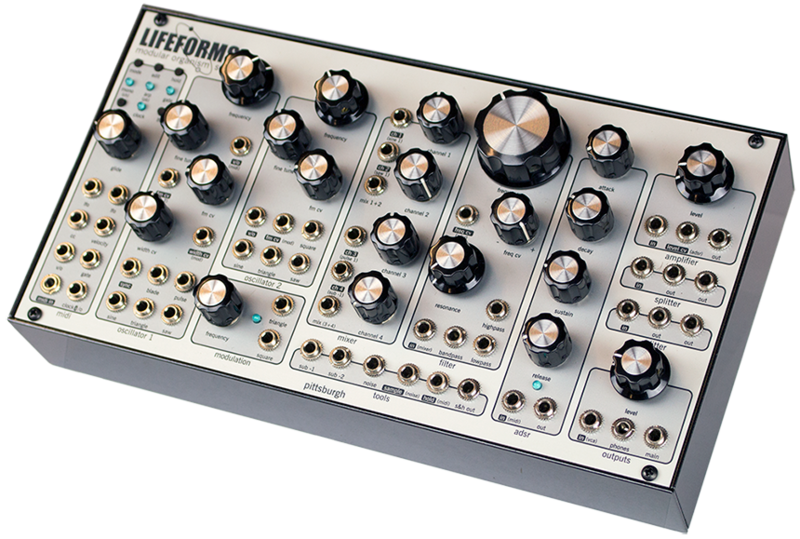 More information on the Lifeforms SV-1 is available at pittsburghmodular.com/lifeforms-sv-1. Shape music like never before with the Pittsburgh Modular Lifeforms KB-1 pressure sensitive controller. The Lifeforms KB-1 eurorack module provides a multi-function, expressive, capacitive touch keyboard designed for performance. It contains a powerful one octave pressure sensitive keyboard complete with arpeggiator, step sequencer, preset voltage memory array, and a pair of multi-mode trigger pads. Eleven patchable outputs and a deep feature set enable an unprecedented level of control over any eurorack system. More information on the Lifeforms KB-1 is available at pittsburghmodular.com/lifeforms-kb-1. Our new line of Structure enclosures pushes eurorack case technology forward. With new, innovative power supplies providing extreme amounts of clean, quiet power, up to 3x the power available in other brands, Structure cases are designed to work with the most sensitive analog and power hungry digital modules. To improve the strength of the Structure shells, our engineers tested countless combinations utilizing different types of wood, joints, adhesives, assembly techniques, and hardware. The result is our most robust and refined case line yet. With massive amounts of both room and clean, quiet power, Structure enclosures are the perfect start to any eurorack modular system. The Structure enclosures are available in three sizes. 96hp, 208hp, and 360hp. The Structure EP-96 is a 96hp desktop case. A perfect case for starting a eurorack synthesizer. The Structure EP-208 and Structure EP-360 are serious, road ready travel cases. The right choice for large or growing systems. More information on the entire line of Structure cases is available at pittsburghmodular.com/structure.